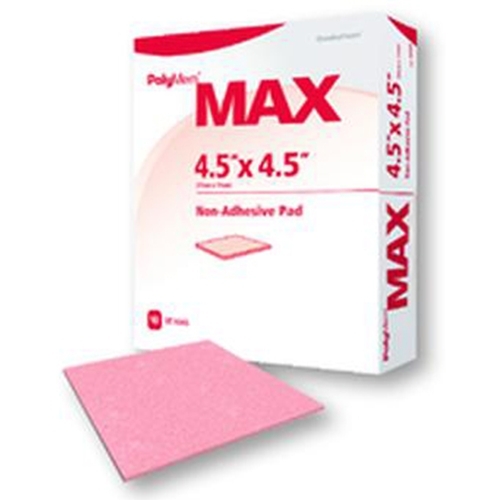 Ferris Polymem Max Wound Dressing from HealthyKin.com has a configuration that is a thicker PolyMem formulation for wounds with heavier drainage or when longer wear time is desired. Appropriate for use as a combined primary and secondary dressing or as a secondary dressing. This product helps fight infections on an open wound and greatly absorbs fluids. I wish it would absorb MORE fluid but with daily changes, it greatly helps to heal stubborn wounds. Actually ordered in error. Did not intend to get the "Max" version. For most of my skin tears the regular thickness suffices but will keep this on hand just in case I need something more absorbent.